Hey, it’s fall yall!! My favorite time of the year! I love everything about fall, the fallen leaves crunching beneath my boots, the crisp chill in the air, the evenings spent around the fire roasting marshmallows and laughing, the fireplace crackling, the old comfy quilts on the sofa on a chilly morning and of course everyone’s favorite pumpkin flavored everything!!!! Oh yeh, you know what I am talking about, the first hint of a chill in the air and we all wake up and the world has been taken over by pumpkin spice everything, and you know what? It’s wonderful. No flavor better represents fall, the pumpkin, the cinnamon, ginger and nutmeg, together they just scream fall. I love it, my husband loves it, my son loves it. We are a pumpkin spice family for sure. My husband is obsessed with pumpkin spice coffee and our fridge is always stocked with Coffee-Mate Pumpkin Spice creamer for his coffee. 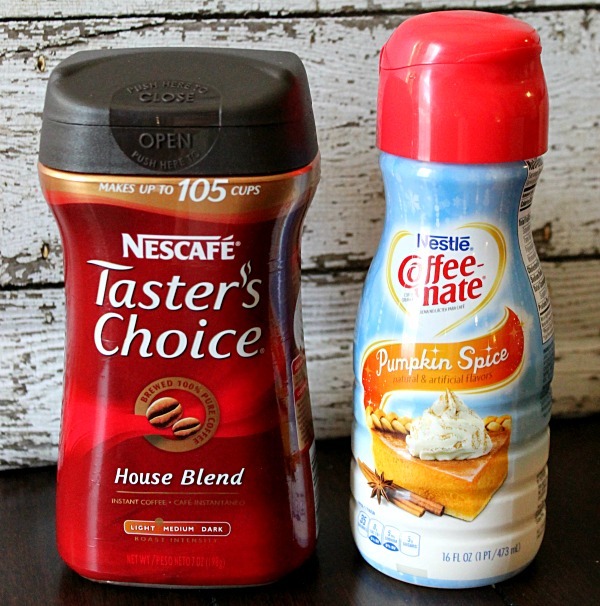 Plus with Nestle Taster’s Choice House Blend coffee we can have all that pumpkin spice coffee bliss in minutes! It has been a long week around here with the heat going out just has the weather really turned cold and some house renovations that has our dining room literally tore up from the floor up. So I decided when Friday night rolled around and we sunk our exhausted bodies into the warm nest of quilts in front of the TV I would make a special treat for us to enjoy while catching up on our shows. 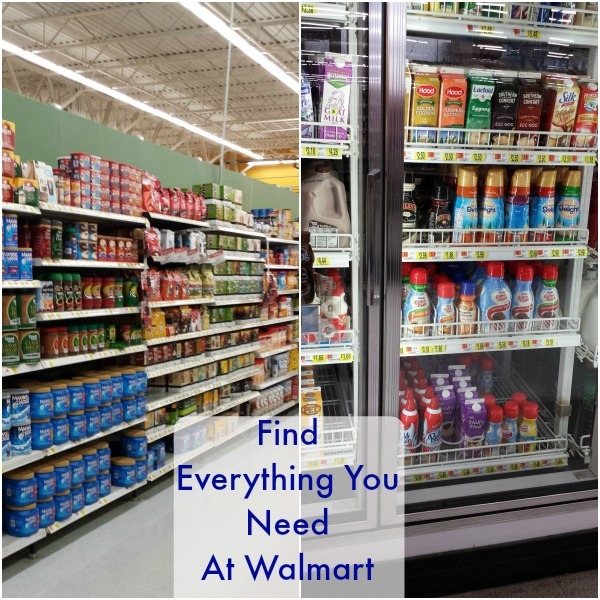 I headed to Walmart for my weekly grocery shopping and was able to grab all the ingredients for our fabulous special dessert. It was easy to spot the Coffee-Mate Pumpkin Spice creamer and the Taster’s Choice House Blend which I needed both for the dessert and for our morning caffeine fix. Once at home I got to work on our treat Pumpkin Spice Tiramisu! So easy to make, you can whip it up in minutes and it tastes heavenly!! Now being that we had had such a hectic week, this mama took a little help from Walmart’s bakery section and picked up a premade angel food cake for the cake portion of the tiramisu. I know traditional tiramisu calls for lady fingers but I can never find those! So I made a mug of coffee and added the pumpkin creamer to it. I diced up the angel food cake and whipped together some cream cheese, whipped topping and sugar. I grabbed two little mason jars and started layering and before I knew it dessert was done!! We loved these! They were the perfect little snack for after dinner and that little caffeine boost from the coffee helped us stay awake through all our shows! Of course our favorite part was the pumpkin spice part, so yummy!! 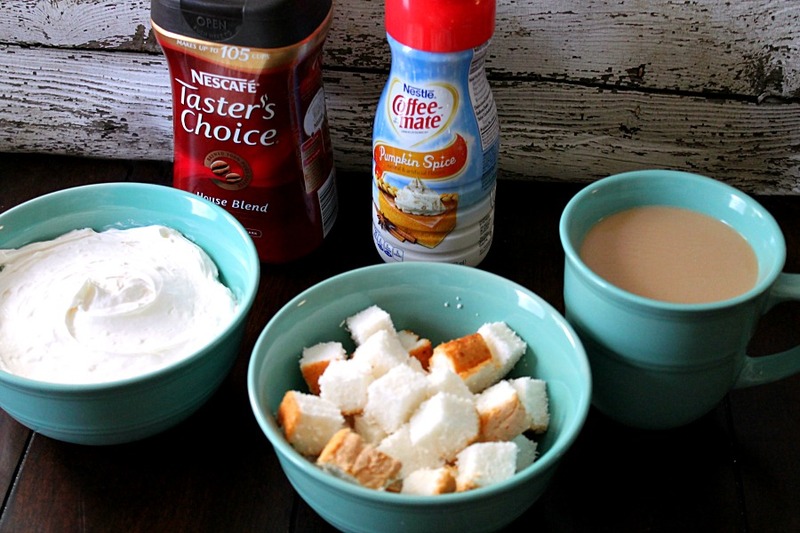 In a mixer blend the sugar, cream cheese and whipped topping. Mix the Pumpkin Spice cream with the coffee. 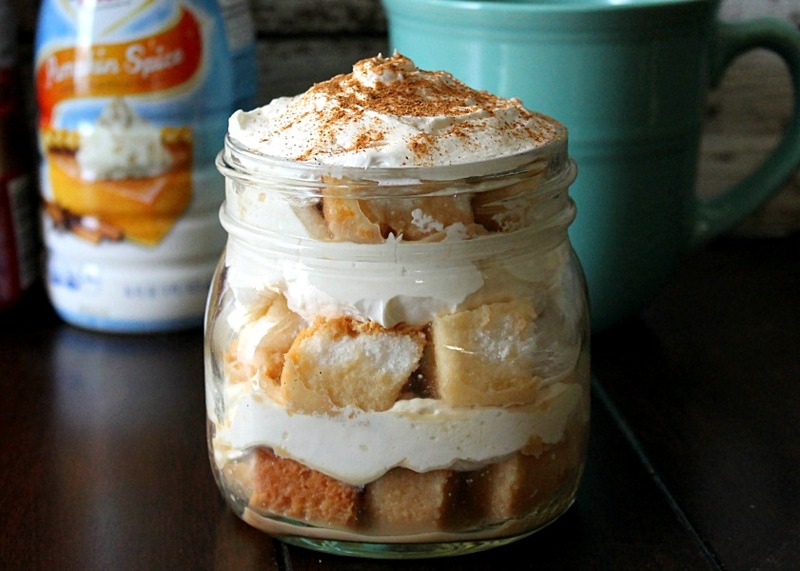 Layer the angel food cake down the bottom of your mason jar or trifle bowl. Drizzle the cake with the coffee until each piece has a little coffee soaking into it. Top with a layer of the cream cheese mixture. Continue layering until the top. Sprinkle just a dash of pumpkin spice on the top and serve! So just take a few minutes and whip up a few of these for your chilly fall night, or you can make one large one for parties or get togethers! How much do you love pumpkin spice? 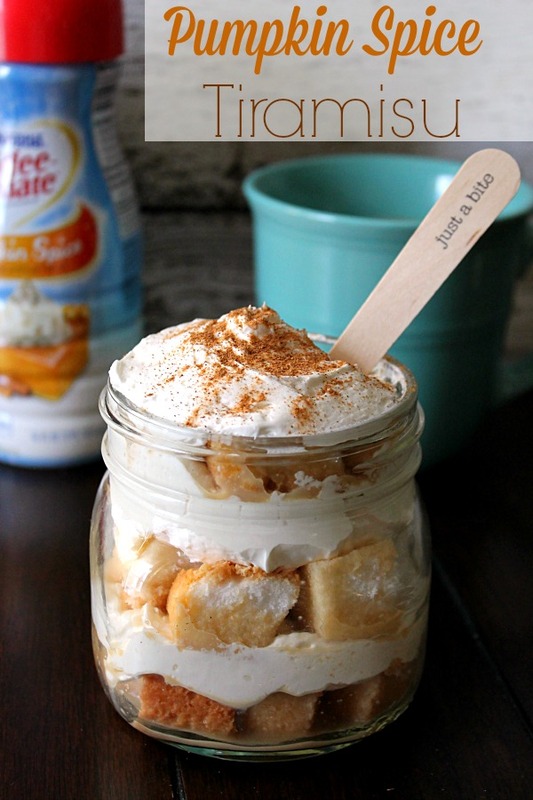 Check out this Pinterest board for more yummy ideas! “The first hint of a chill in the air and we all wake up and the world has been taken over by pumpkin spice everything” It’s true, and i love it as well!! LOL!! Your Pumpkin Spice Tiramisu looks delcious! This looks like such a delicious recipe, and so creative! I need to try it! Dropping by from SITS Sharefest! This looks amazing. I love pumpkin and tiramisu. What a great combo. This looks perfect!! and i just love those little spoons. So cute! Thanks for sharing, pinning for later. Tiramisu is one of my favorite desserts. My grandmother used to make it each year for my birthday until one year she forgot to add the sugar and we dubbed it Terriblemisu:) Thanks for sharing this! I hope you will stop by the Found & Foraged Linky Party next week too! (Saturday @ 8PM CST) Hope to see you there http://www.thebigrevealblog.com! Omg that is hilarious!!!! Thanks for stopping by!!! 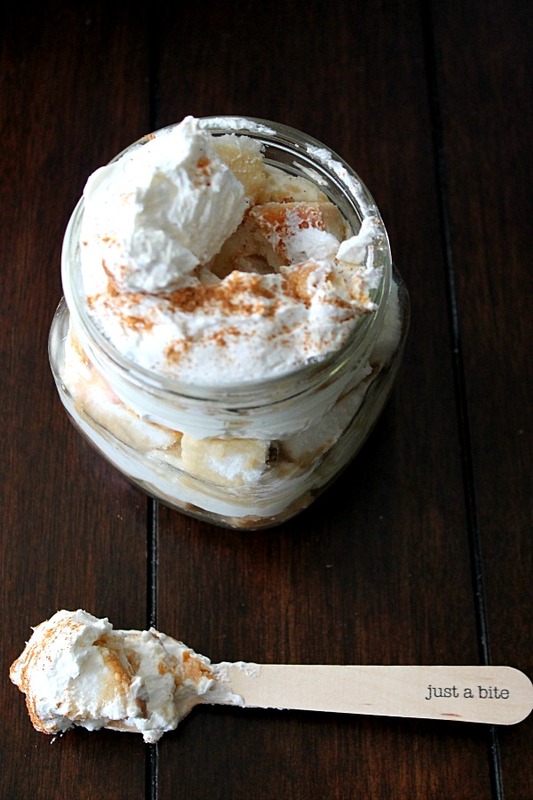 oh yeah I will take a couple jars of these pumpkin spice tiramisu! Lovely recipe, appreciate your sharing Parrish! This looks very delicious. I have only been able to find ladyfingers at Publix. Which is a bit of an inconvenience because we don’t have one in our mall town. So, it is good to have another option. Holy moly that looks amaze-balls! I need to figure out how to do it Gluten free, but I’ve pinned it, and I’m going to try! This one makes my mouth water. So happy you linked up at Found & Foraged. Hope to see you back Saturday night at 8PM! Hi Parrish, Sound & looks so yummy! Yum! This looks absolutely amazing. I can’t wait to try it when my friends come over on Tuesday.